, a learned physician and antiquary, was a native of Westmoreland, where he was born in 1716, and practised physic with considerable reputation at Kendal about 1745. At what time he removed to London we have not been able to discover, as very few particulars of his life have been recorded, but it was probably about 1751, when he was admitted a licentiate of the College of Physicians. In 1752 he was elected a fellow of the Royal Society; and on the first establishment of the British Museum, in 1756, he was appointed under-librarian of the manuscripts and medal department. 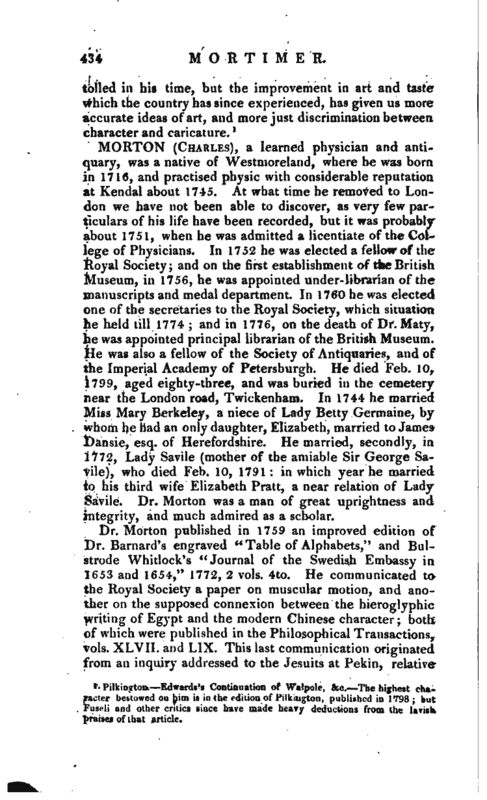 In 1760 he was elected one of the secretaries to the Royal Society, which situation he held till 1774; and in 1776, on the death of Dr. Maty, he was appointed principal librarian of the British Museum. He was also a fellow of the Society of Antiquaries, and of the Imperial Academy of Petersburgh. He died Feb. 10, 1799, aged eighty-three, and was buried in the cemetery near the London road, Twickenham. In 1744 he married Miss Mary Berkeley, a niece of Lady Betty Germaine, by whom he had an only daughter, Elizabeth, married to James Dansie, esq. of Herefordshire. He married, secondly, in 1772, Lady Savile (mother of the amiable Sir George Savile), who died Feb. 10, 1791: in which year he married to his third wife Elizabeth Pratt, a near relation of Lady Savile. 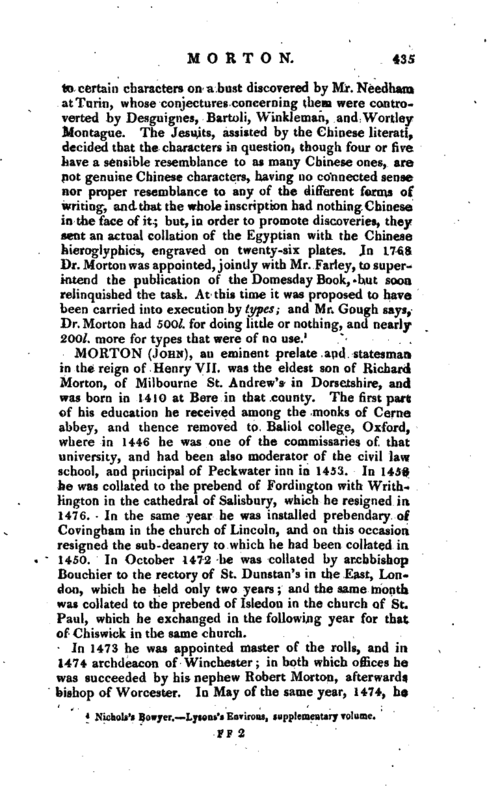 Dr. Morton was a man of great uprightness and integrity, and much admired as a scholar. 1 Nichols’s Bowyer.—Lysons’s Environs, supplementary volume.